You may think that Thailand is a very homogeneous population and that everyone living under the Red, White and Blue flag considers themselves Thai. But alas as is the case with everywhere in the world, different populations will not consider themselves the same people. We started our three day trek through the Mei Tang wilderness area past rice fields and hot springs. We stayed the night at a local Karen village where we were greeted with a massive feast of homemade spring rolls and curry. The Karen people are a distinct group in Thailand that lives in villages in the hills of Northern Thailand surrounding Burma and Laos. Many of them have had to flee into Thailand as refugees surrounding the violence that has occurred in Burma. We learned from our guides who were ethnically Karen about the history of the tribe and many of the challenges they still face in coming to Thailand as undocumented refugees. We then continued our hike, stopping to take a long solo hike as our OE’s prepared written prompts for us to think about as we hiked alone. Coming across the hike we prepared for lunch as a sunrise that had been teased earlier was finally revealed to us in the form of two hulking grey beasts. 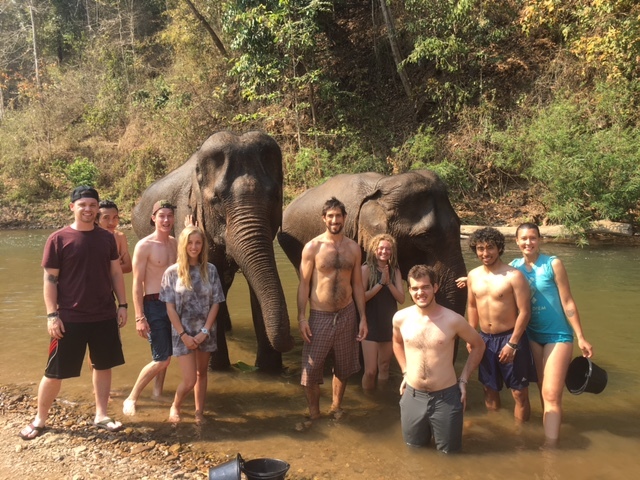 We were allowed to feed these domesticated Asian Elephants bananas and pumpkins and washed and climbed on them as they bathed in the nearby river. We then continued walking down the river until we met up with a Lahu village built along the side of a hill. The Lahu are another ethnic group living in Thailand with a distinct culture from both the other hill tribes and mainstream Thai society. We had another gratuitous meeting with the tribe and were able to sit around a fire late into the night telling ghost stories and hearing Karen and Lahu tales. In the morning we put the walking aside and hopped on rafts made from bamboo shoots tied together. We cruised down the river passing through light rapids and beautiful vistas that the river runs through. We even had a dog leap onto our raft at the Lahu village and ride with us the entirety of our river trip. We then went back into Chang Mai and enjoyed our one night of rest before we were back on the road, catching a 7 am bus ride to Chang Rai. When we arrived we were greeted by a NGO called the Mirror Association. There we learned about many of the problems plaguing the hill tribes of Thailand, such as the inability for many people who have lived in the country their whole lives to even obtain citizenship. We are staying now in a bamboo house in a Lahu Village where wild children wake us up every morning by yelling in Lahu into our rooms. Where we are spending the afternoons knee deep in mud farming in a rice paddy. It’s quite an amazing experience and I can’t wait for the next sections of our trip.